Ordinarily, when a new device hits the market, the talk is of innovation and revolutionary new features. However, the big story in the tech sector in recent weeks has been Nokia’s reincarnation of its 3310 phone. The original handset was wildly popular in the early 2000s, characterised by its long battery life and its popular game “Snake.” Indeed, it was many people’s first phone. However, Nokia’s brand has suffered in recent years as it lost out to companies such as Apple and Samsung, whose devices consumers felt better fitted their needs. A succession of rebrands – from Nokia to Lumia to Windows – also left potential customers confused. But in the wake of the 3310 re-launch, YouGov brand tracking data indicates that the news has given the embattled brand a much needed shot in the arm in terms of positive press coverage. 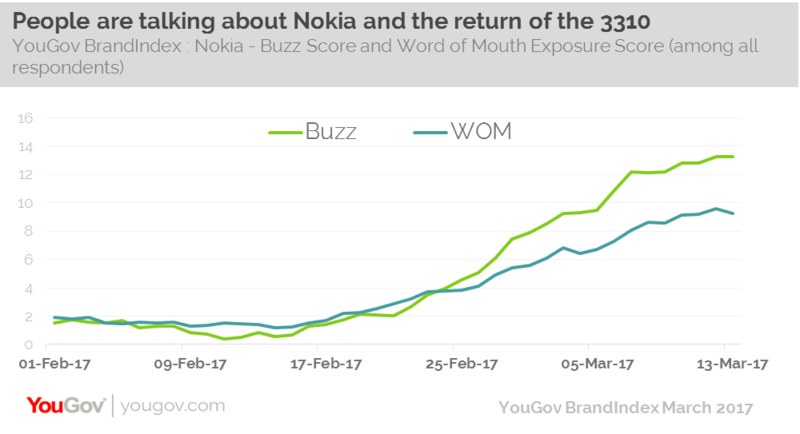 Nokia’s Buzz score (whether someone has heard something positive or negative about the brand in the past fortnight) has increased by 11 points among all respondents since the relaunch was announced. The news certainly has people talking about Nokia again. Its Word of Mouth Exposure score (whether someone has talked about the brand with someone) has also risen dramatically – from 3% to 10% in the last two weeks. Indeed, it is the brand that has shown the greatest improvement on this measure over the last month. Nokia know that the revamped 3310 models aren’t going to replace smartphones, but then it knows they are not trying to. It is more likely the phone will be used by festival goers or those looking for a backup phone, as well as older phone users that don’t want the complications a smartphone sometimes presents. It will also attract those developing markets outside of the UK. Nokia has successfully harnessed a feeling of nostalgia, which is reflected in other areas of society, such as the re-emergence of vinyl in the music industry. The reaction to the news also points towards the affection consumers did have for the brand in the pre-smartphone era. The phone won’t be an immediate cure for Nokia’s ills, but is a welcome change to the negativity that has surrounded the brand in recent years.